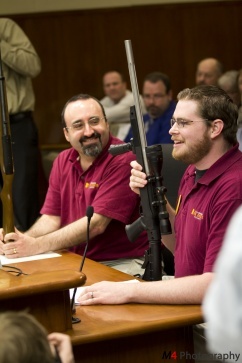 GOCRA President Andrew Rothman (left) testified on the purely cosmetic differences between a regular rifle and an "assault weapon." Passed the Minnesota Citizens Personal Protection Act (permit to carry) -- one of the best carry laws in the country -- twice! Passed the Range Protection Act, ensuring that current and future generations will always have places to practice not only the shooting sports but Self Defense as a fundamental human right. How can I support GOCRA and Minnesota gun rights? Become a supporting member, and help us fight for your rights. Sign up for GOCRA’s email list, so we can keep you informed of urgent gun rights issues. We never share your information with anyone else, and we don’t send spam. GOCRA’s success in passing the carry law and range protection was a direct result of local, grass roots activism. Unlike anti-gunners, we don’t have paid lobbyists. Tell your local, and state and congressional representatives are a priority for you, and that you vote. This is especially important when they are considering gun legislation. Take advantage of opportunities in your community to talk about and work for gun and self-defense rights. Get your friends and family interested in shooting sports and gun rights. Take them to the range, and get them to sign up for our mailing list, too! Victory goes to those who show up. Learn the issues, get involved, and vote your rights! GOCRA has no paid staff, but depends on contributions from Minnesota gun owners like you to cover expenses like our web site, postage, materials for legislators, and printing items like this flier. To contribute, see a GOCRA representative, click the donate button on the left, or mail in a check.